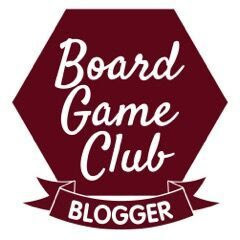 The Brick Castle: Summer Round Up - Things To Make Your Summer Go More Smoothly. 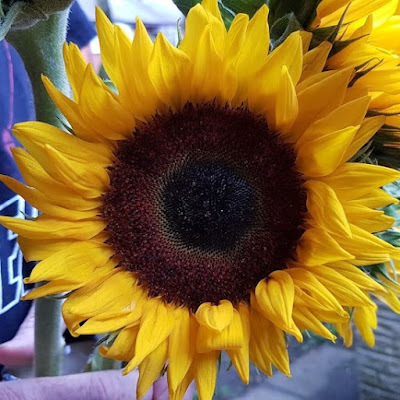 Summer Round Up - Things To Make Your Summer Go More Smoothly. 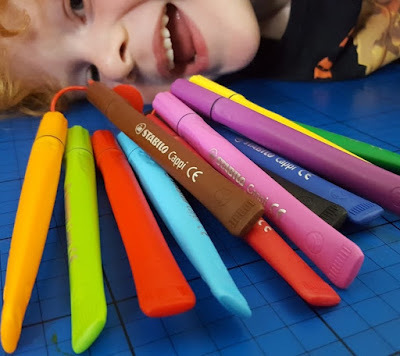 Stabilo Cappi Fibre Tipped Pens are a genius idea for preventing children from dropping or losing all of their colouring pens - and the all-important pen lids! The lids snap onto the pens tightly, and have a loop at the top so that they can thread onto the enclosed plastic ring. These are lovely pens. 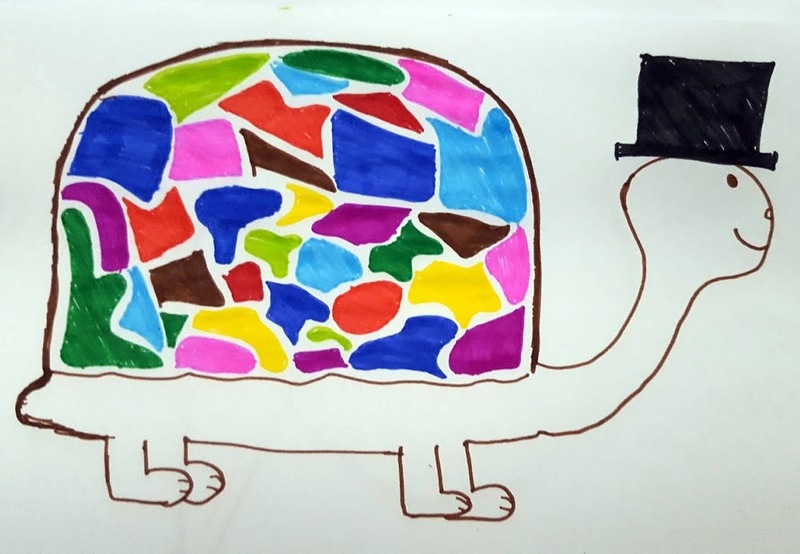 They are clearly excellent quality and the colours are amazing. 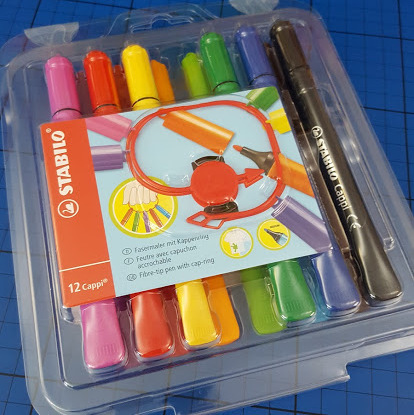 Stabilo Cappi pack of 12 multicoloured pens have an rrp. of £6.89 and are currently on offer at £5.50 from Stabilo. 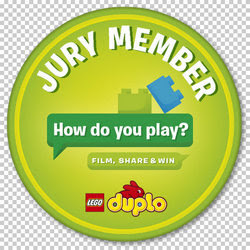 Also available from supermarkets, stationers and online. 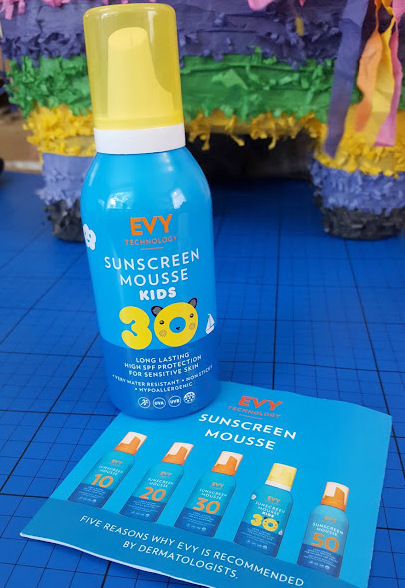 EVY Sunscreen Mousse is consistently voted Sweden’s No.1 safest sunscreen, and is gentle enough to use on the most sensitive of skins, from the age of six months upwards. Only a small amount is needed to protect for up to six hours, and all five formulations offer more than 90% UVA protection and are UVA five-star rated. 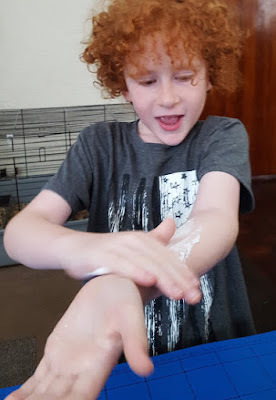 Fragrance-free and hypoallergenic, its mild yet effective formulation helps to strengthen the skin’s protective barrier whilst being extra gentle. Factors 20, 30 and 50 also contain vitamin C, collagen and silk and all are suitable for use on the scalp, around the eyes and on lips. We've tested the EVY Sun Mousse SPF30 Kids (150ml) and it is lovely to use. The mousse isn't sticky and doesn't get all over your clothes, it rubs in really well. The protection from the sun on my pale shoulders and arms seems good and even and as expected. We all really like it, and the supersoft skin is a real hit with myself and my 16 year old daughter. The EVY range is new to the UK for summer 2016 and retails at £18.95 for 150ml in factors 10, 20, 30, 30 Kids and 50 (SPF50 costs £18.95 for 100ml). EVY After Sun Mousse also costs £18.95 for 150ml. For further information visit the EVY Skincare website. Excilor 3in1 Protection Spray is a water-resistant invisible barrier to protect your feet from all the nasties the beach, pool, or even garden can introduce. It provides protection from verrucas, athletes foot and nail fungus and is recommended for gyms, swimming pools and public areas, protecting your feet for up to 8 hours. 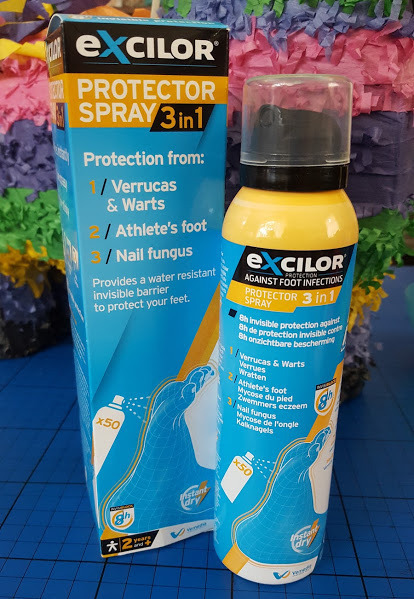 Excilor also promises to protect your feet and toes from more mundane germs caught from walking barefoot in communal areas or borrowing shoes. 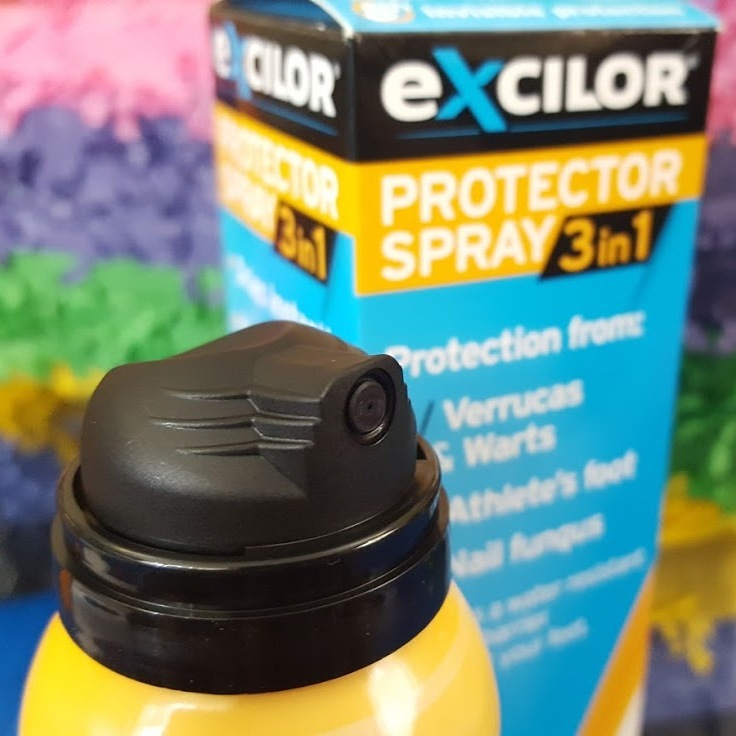 The Excilor Protector Spray will wash off with soap, but doesn't actually have to be removed, and will leave your feet clean and moisturised. The spray looks like water, with a strong smell that dissipates into a gentle talcy, sweet smell quickly. 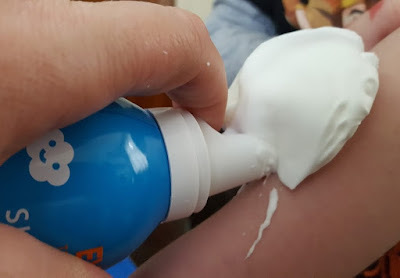 It dries in seconds, and your skin does feel like it has a thin layer coating it, it's only very slightly tacky (not sticky), and not uncomfortable or intrusive. Excilor 3in1 Protection Spray costs £9.99 for a 100ml spray, available from Superdrug and Boots, where it is currently on offer for £7.99. 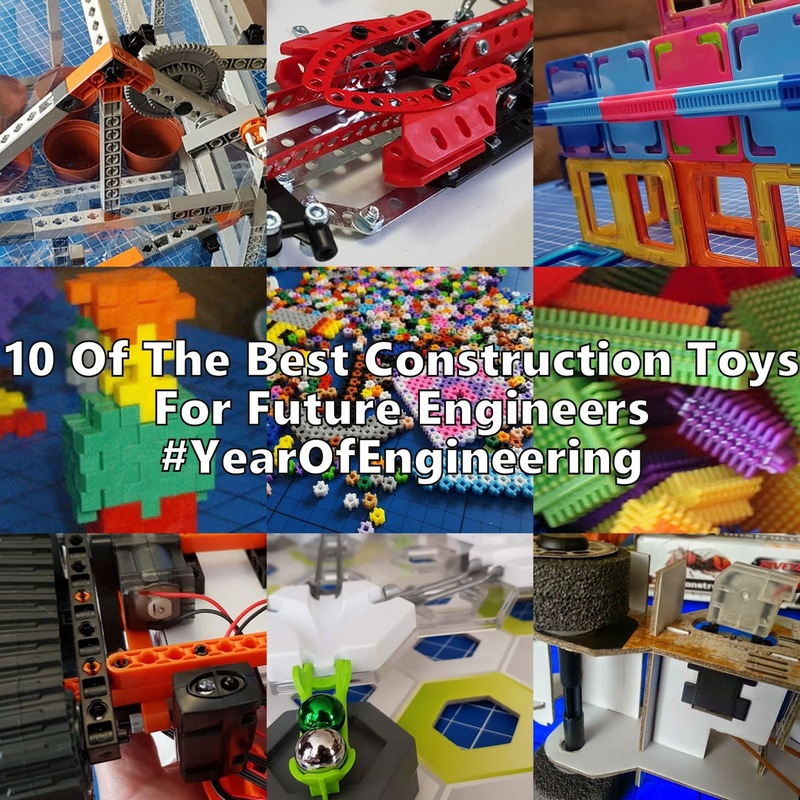 Each bottle will provide over 50 applications, age 2+. 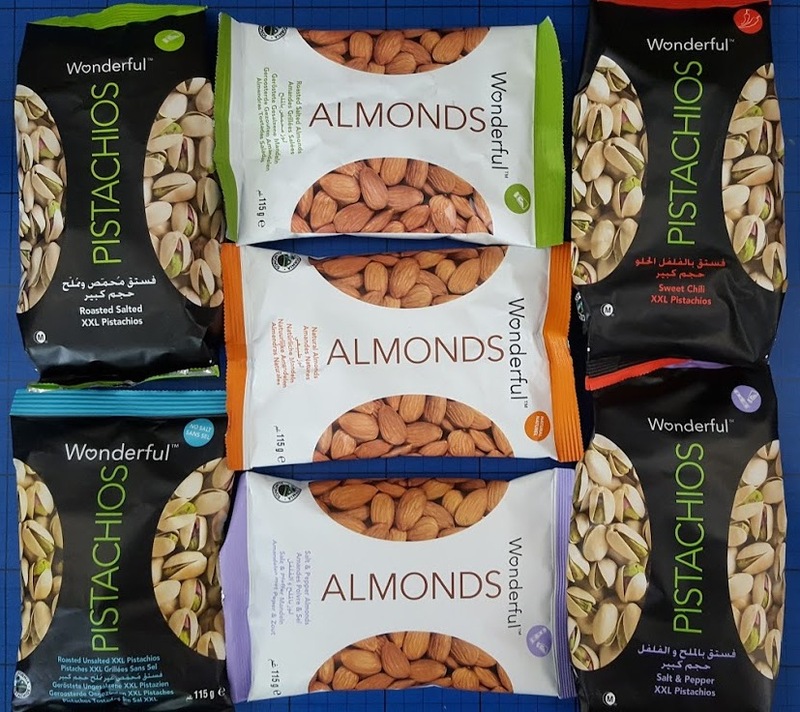 No trip is complete without snacks, and Wonderful Pistachios have a massive 7 varieties of Pistachio and Almond savoury snacks. They won't rot your children's teeth or make them hyper, but will fill them up, and provide them with protein and a bunch of other goodies. Wonderful Pistachio have 4 different Pistachio options, all roasted without extra oil - unsalted, Salted, Sweet Chilli and Salt & Pepper. They are all gorgeous. Truly. This photo was moments after I said I'd finished taking my photos. 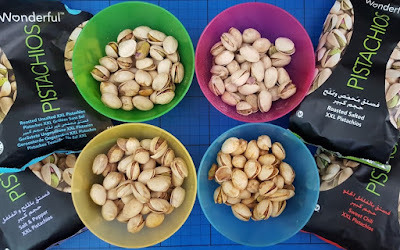 It's hard to pick a favourite Wonderful Pistachio, and I'm tempted to say Sweet Chilli, but I think Salt & Pepper just nails it. All gorgeous though, easy to open and beautifully fresh. 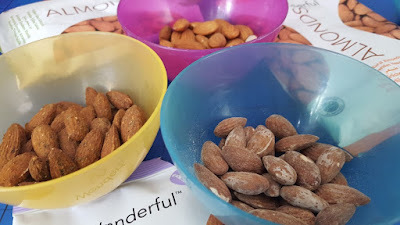 Wonderful Almonds weren't quite such a hit because Almonds aren't quite so popular here. We found the Salt And Pepper Almonds really peppery, so very much like Marmite very much loved or hated. The Salted Almonds and Unsalted were rated equally, but the quality of nuts is excellent throughout. 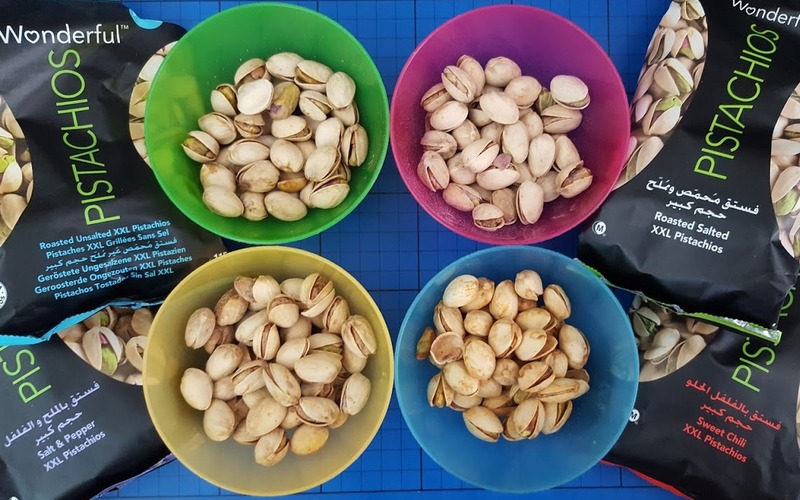 Wonderful Pistachios cost around £3.95 for 220g or £1.99 for 115g and are available major retailers including Ocado, Sainsburys, Tesco and Holland And Barrett. 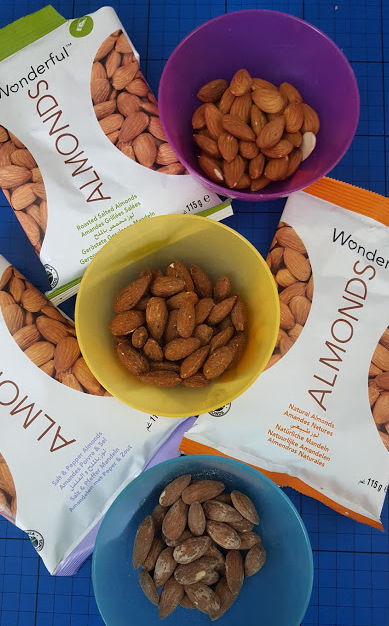 Wonderful Almonds cost around £3.79 for 200g or £2.39 for 115g and are available at major retailers including Ocado. Find out more on the Wonderful Pistachio website. If you are going to eat, you need to drink, and Naturelly Jelly Juice is a big favourite of ours. 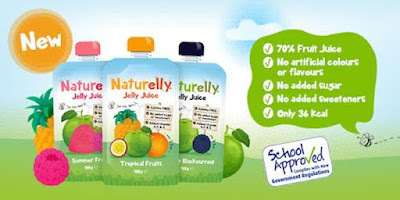 A soft jelly texture which is suitable for vegetarians and vegans, gluten-free, Kosher and Halal, the Jelly Juice is 70% fruit juice with no added sugar or sweeteners, no artificial flavours or colours. 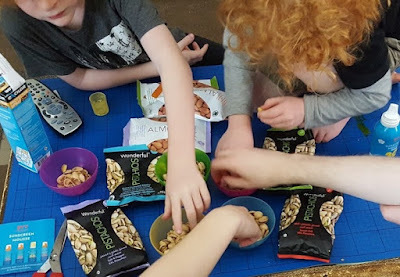 Naturelly has been shortlisted for both “Best Child’s Snack” and “Best Toddler Snack” by Loved By Parents magazine, and they get our vote because my boys think it's a massive treat. Available at Boots priced £1.19 per pouch, or online from Amazon. 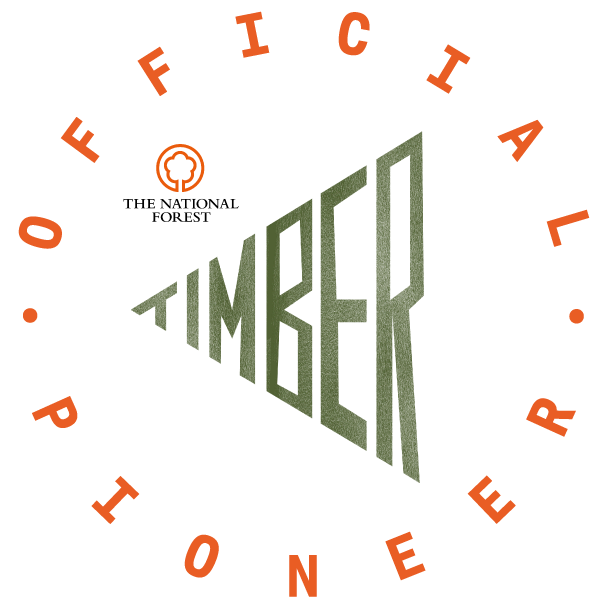 Find out more on the Naturelly website. 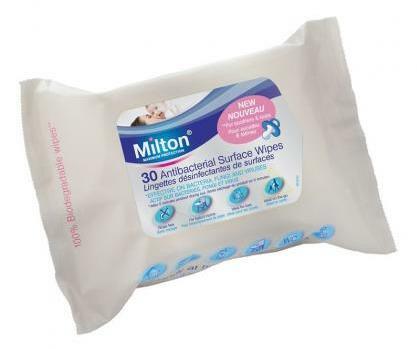 You don't want a tummy bug on holiday, so it's a time for taking sensible precautions and Milton have a series of solutions including their infamous Sterilising Fluid and Antibacterial Surface Wipes. 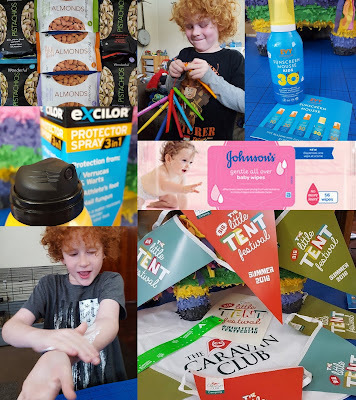 I was given a sample of the wipes at Blog On, and they're perfect when you pull out camping equipment, garden tables and even garden toys that have been in storage for the best part of 9 months to a year. Great for portable toilets and cleaning up on holiday, it's almost like cheating. Available at all major retailers priced around £1.69 for 30 wipes. My ultimate essential wherever you are going, or whatever you are up to, is wipes for the humans. Johnson's Baby Wipes have had a packaging revamp and the new boxes only let one wipe out at a time, cutting down waste and annoyance, plus sore fingers from trying to stuff them back into the pack! Safe as water on newborn skin. Free from alcohol, soap and fragrance, Johnson's Baby Wipes are suitable for even the most delicate and sensitive skin. Available at all major supermarkets at around £1 a pack of 56 wipes, cheaper for multipacks. 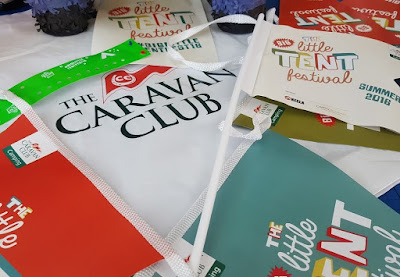 If you don't have any plans to go away, and we don't this year, you can always experience the joys of festivals and camping with the Big Little Tent Festival from The Caravan Club. 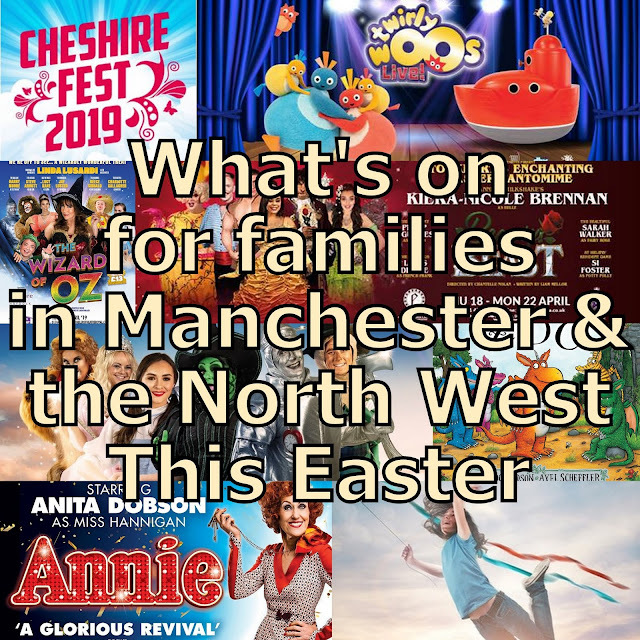 The official Big Little Tent Festival weekend will be taking place on the weekend of 16 and 17 July, but, if you can’t make that, families can join in throughout the summer holidays on a day that works best for them. Festivals need not be expensive, or involve muddy fields for that matter, as the Big Little Tent Festival will focus on pitching a tent in your own back garden, making memories together and exploring the nearby wildlife whilst being close to home comforts. I was sent a sample of most of the items shown above in order to review it.